Amazon founder Jeff Bezos has overtaken Bill Gates to become the world’s richest person, worth $90.6bn (£69bn). 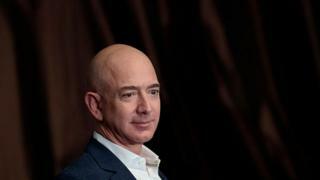 A rise in Amazon shares on Thursday means Mr Bezos’s worth has now eclipsed the Microsoft co-founder, according to the latest Forbes Index. Mr Bezos owns almost a fifth of the shares in Amazon, whose value has now exceeded $500bn. In recent years he has focussed on his Blue Origin space rocket business and the Washington Post, which he owns. Soaring tech stocks have fuelled huge growth in the worth of entrepreneurs such as Mr Bezos and Facebook’s Mark Zuckberberg. The Bezos family also has homes in Seattle and Beverley Hills, but expenditure on property pales into insignificance compared to Mr Bezos’s foremost passion: rocket science. One advantage of being super-rich is that people indulge your fantasies. As a life-long Star Trek fan, Mr Bezos was able to secure a minor role in the latest movie. But you may find it hard to spot him on film, since the Vine he posted shows him pretty effectively disguised in a wrinkly grey mask. He has never really disguised his inner geek however. As a child he spent a lot of time with his grandparents on their Texas ranch (learning to vaccinate cattle amongst other vital skills) and his interest in number-crunching was already apparent. “At that age I’d take any excuse to make estimates and do minor arithmetic. I’d calculate our gas mileage, I’d figure out useless statistics on things like grocery spending,” he told Princeton’s class of 2010. For example he whiled away some time calculating that smoking would be likely to take nine years off his grandmother’s life. “I expected to be awarded for my cleverness and my arithmetic skills,” he said. But his grandmother burst into tears. Grandfather talked him through how sometimes “it’s harder to be kind than clever”. As well as the fun stuff he has a serious futuristic vision. Early on he was already imagining space hotels, amusement parks, and cities orbiting the Earth. And Mr Bezos’s dreams are getting bigger. “I want millions of people living and working in space. I want us to be a space-faring civilisation,” he told Geekwire last year. He predicts that in the next few hundred years we will put all our heavy industry off this planet, mine resources and generate energy in space, leaving earth a much more pleasant place to live on. Mr Bezos does plan to go into space himself too, of course – once Blue Origin is ready to take him. But as Blue Origin’s slogan says: Gradatim Ferociter, (apparently Latin for “Step by Step, Ferociously”) maybe he’s not rushing things. 2017 Manchester By The Sea, a feature produced by Amazon Studios, wins two Oscars including best actor for Casey Affleck.